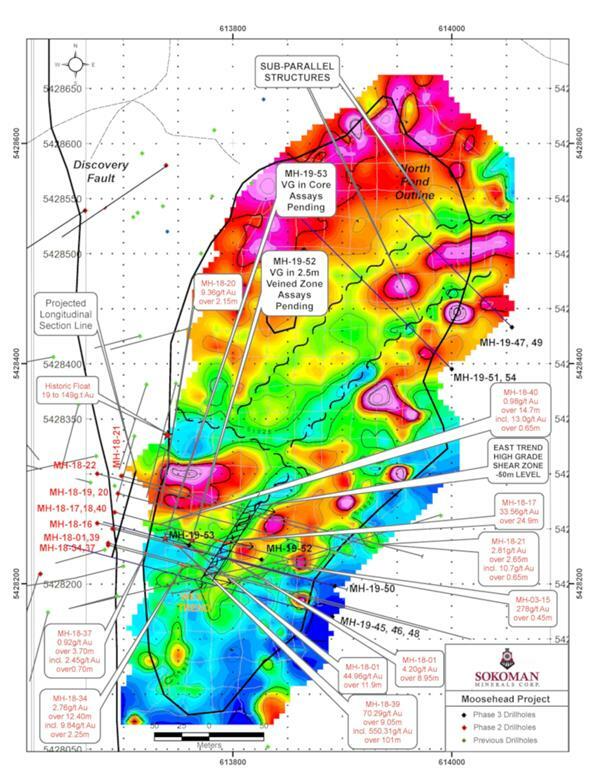 ST. JOHN'S, NL / ACCESSWIRE / March 1, 2019 / Sokoman Minerals Corp. (TSX-V: SIC) (OTCQB: SICNF) (the ''Company'' or ''Sokoman'') is pleased to announce that diamond drilling operations are ongoing with two rigs, including the proposed drilling on North Pond, which began late last week. To date, 12 holes, totaling approximately 2,500 m, have been completed utilizing two rigs, including two holes (MH-19-52 and 53) from the surface of North Pond. MH-19-52 cut a 2.50 m* wide visible gold bearing quartz vein starting at 91 m down-hole, in a broader section of weak to moderate deformation up to 10 m* thick. MH-19-53, drilled on the same section approximately 50 m up-dip, encountered a more intense structure over a 12 m* width beginning at 28 m down-hole that carried broken and disrupted sections of visible gold bearing quartz veining up to 0.30 m thick. The rig has been moved 25 m north of MH-19-52 and 53 and will begin drilling a three-hole section through the shear zone focusing on depths between 50 and 100 m below surface and will attempt to extend northwards, the mineralization believed to have been largely missed by the section hosting MH-18-19 and 20. MH-19-50, drilled on the same section as MH-18-01, intersected approximately 5 m of quartz veining with disseminated sulphide mineralization and at least 1 speck of VG beginning at 146.50 m down-hole. MH-19-45, 46 and 48 were drilled from the East side of North Pond targeting the down dip extension of the shear zone hosting mineralization intersected in MH-18-34 and 37; all three holes intersected the east dipping shear zone with thicknesses of up to 24 m with variable amounts of quartz veining and sulphide mineralization; locally, mafic dikes have intruded along the shear zone. Two holes were also completed (MH-19-43, 44) in the vicinity of historical hole MH-04-02, 500 m south of the main Eastern Trend, where previous operators noted the presence of fine visible gold in irregular veined zones hosted by strong shear/fault zones up to 10 m in thickness (maximum assay of 0.27 m @ 2.19 g/t Au). Both holes intersected sheared and veined rock similar to 04-02 (no VG noted) and samples have been submitted for assay. (*Drilled thicknesses reported from Phase 3 holes are believed to be nearly 100% of true thicknesses. Logging and sampling of many of the noted holes is ongoing, therefore sections will be provided once logging and sampling has been completed). Diamond drilling on North Pond is currently drilling the third hole from the ice surface. The first two holes (MH-19-52 and 53) were designed to verify the location and thickness of the section containing the discovery hole MH-18-01 at approximately the same level as the discovery intersection (approximately 70 m below surface). The mineralization observed in MH-19-52 and 53 is typical of the high-grade veins in previous holes, includes multiple (>20 specks in MH-19-52) sights of mm size visible gold, associated with stylolitic veining with minor amounts of pyrite, sphalerite, boulangerite and arsenopyrite. There are currently between 24 and 27 inches of ice over most of the southern portion of North Pond, sufficient to support a single rig and limited support equipment. Ice thickness and its condition are being monitored continuously during the drilling operations as a safety precaution. The Company is also pleased to report that a detailed magnetic survey covering all of North Pond, which was commissioned after receipt of the Earth Tectonics structural report, has outlined potentially significant anomalies that may represent extensions and/or repetitions of the gold mineralized Shear Zone identified by Earth Tectonics in January 2019 (see attached map). The high-grade intercepts to date all appear to have a strong spatial relationship to magnetic lows as shown on the magnetic plot (i.e. MH-18-17, etc.). The Shear Zone, as defined by Earth Tectonics, shows a close spatial relationship to an area of magnetic low intensity (lighter colours). The land-based rig is currently testing the pair of subparallel structures defined by the magnetic survey under the northern portion of North Pond with 50 to 100 m spaced sections. A total of four holes (MH-19-47, 49, 51 and 54) have been completed by the land-based rig to depths of 268 m testing the magnetic anomalies, and have intersected significant zones of deformation and wide zones (up to 20 m drilled thickness) of intense quartz veining with variable sulphide content spatially associated with the linear magnetic anomalies (lows). No assays have been received to date and detailed logging and sampling is ongoing. Sokoman Minerals Corp. (TSX-V: SIC) is a discovery-oriented company with projects in Newfoundland & Labrador, Canada. The Company’s primary focus is its portfolio of gold projects in Central Newfoundland on the structural corridor hosting the 4.2 million ounce Valentine Lake gold project 150 km southwest of the Company’s high-grade Moosehead gold project. The Company also has a 100% interest in an early-stage antimony project in Newfoundland recently optioned to White Metal Resources, as well as a 100% interest in the Iron Horse (Fe/U/REE) project in Western Labrador.